In today’s interconnected world, it’s important that online applications support different cultures. Even if most of us that spend a lot of time online are accustomed to the USA date and number formats, people always prefer to see numbers and dates formatted in a familiar way. People don’t like to think about if the date’s first digit is day or month, or if it’s decimal delimiter or digit grouping mark. Even if we assume that the common internet user can read the shown format based on the website’s supposed location, localization and internationalization (i18n) could greatly improve readability and usability. I have been working on a problem considering DateTime formatting in .NET recently, and I decided to have a look at the cultures and formats that are supported on my machine. It’s really interesting to see this, here is a subset with interesting formats highlighted. If you like, you can see the full results here. de-AT German (Austria) dd.MM.yyyy dddd, dd. MMMM yyyy HH:mm:ss € (2) n. def. Here’s the code I have used. I ran it in LinqPad, the output is provided using the Dump extension method and then exported the results to HTML. RTL = c.TextInfo.IsRightToLeft ? "RTL" : ""
Then I wanted to see these formats in action. So I altered the program a bit. Here are some interesting results produced this way, again a highlighted subset, while you can see the full results here. az-Cyrl-AZ Azeri (Cyrillic, Azerbaijan) 16.12.2010 16 декабр 2010 13:25:43 578 349 026,76 ман. 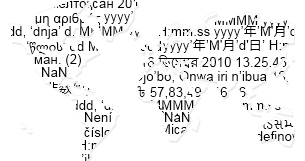 Same language or country doesn’t mean same formatting if there are different cultures. Date patterns are more versatile then I could have imagined. Arabic cultures have a completely different calendar then the western world, for example, 16th December 2010 is 10th Haram 1432 in Afghanistan. Date part order is completely arbitrary, “M/d/y”, “y/M/d”, “d/M/y/” and so on. Japanese Yen is shown only as a rounded number. Germans write Euro symbol (€) before the amount, while the Austrians write it afterwards. Decimal grouping symbol is really versatile, could be a dot, a comma, single quote, blank space… For example, Swiss use single quote (‘). While most cultures group digits by three, some group them by two like Bengali (Bangladesh).